They say starting your day with good breakfast has a great impact on how the rest of your day will be. I agree, and that’s the reason why I like to be creative with my breakfast, and what better way to start your morning than with some chocolate, and I mean my Chocolate Oats Pancake! Early breakfast or late breakfast, I have to have my breakfast. The day when I don’t have a breakfast and of course coffee, is the day when you should avoid me at all costs. 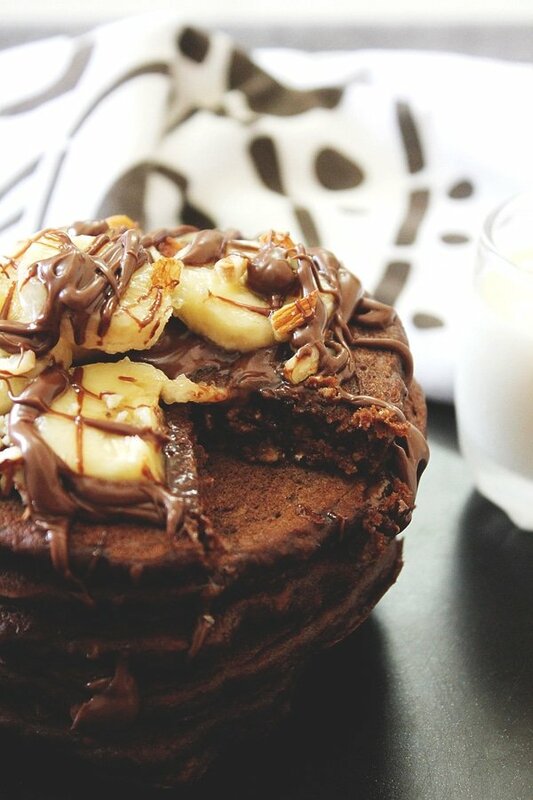 But today I feel good and energetic since I’ve fueled/filled myself with these yummy Chocolate Oats Pancakes. 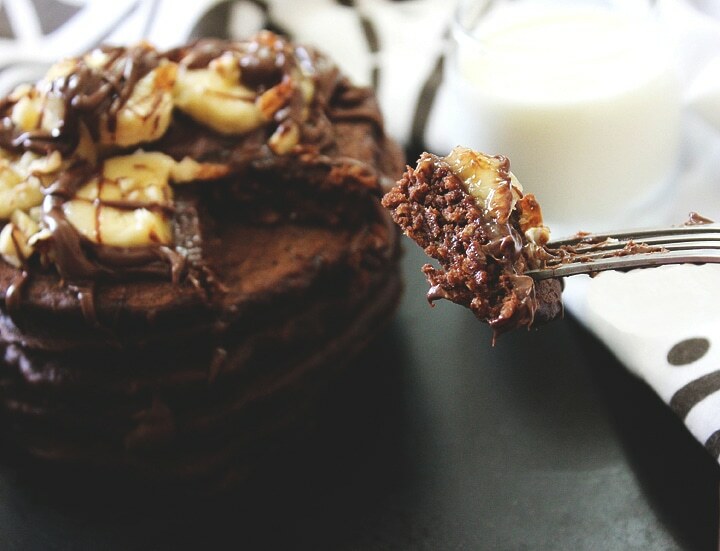 These pancakes are fluffy, and chocolaty, in fact it is everything you want in a chocolate cake, I kid you not! 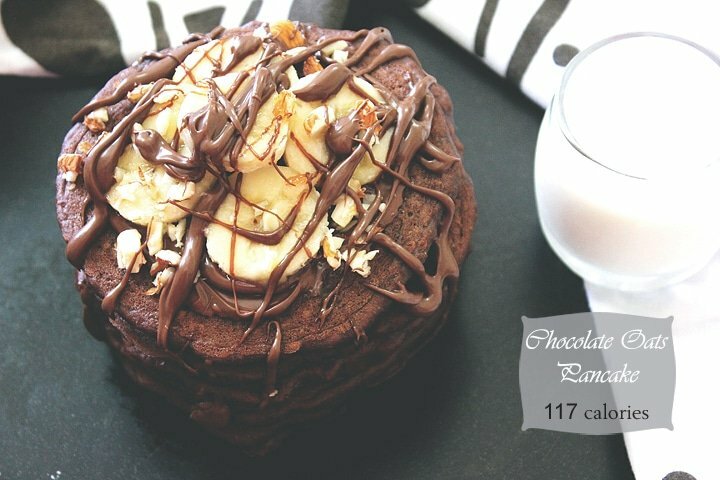 They are light, healthy, tastes amazing, and you or your kids will really feel like eating a cake than pancake. I add slices of bananas on top and that ads a great texture and flavor. 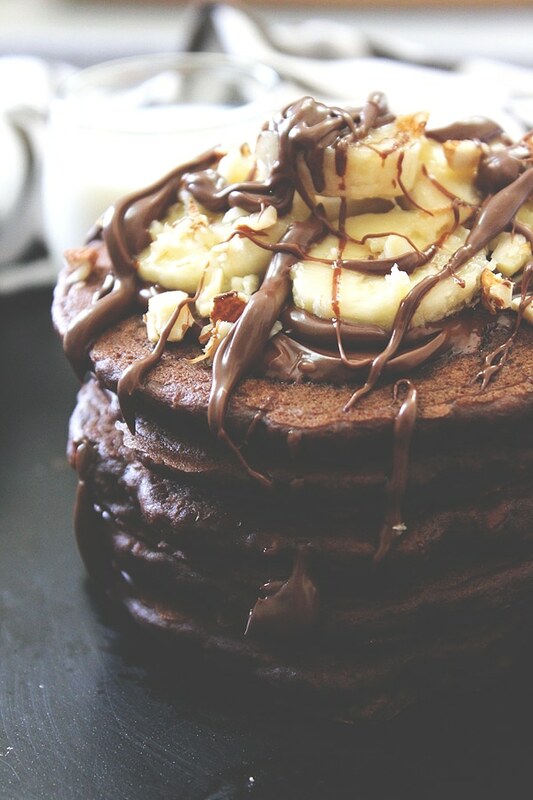 **I have not included the chocolate drizzle (I’ve used Nutella) nor the slices of bananas in the calorie count. So please make healthy choices when choosing the toppings for your pancakes! Makes 6 pancakes. 117 calories per pancake. – In a bowl, add flour, baking powder, cocoa powder, pinch of salt, and oats. Mix well and keep aside. – In a different bowl, beat the rest of the ingredients well, then pour over the flour mixture and whisk gently. Do not over mix, and if there are few lumps do not worry about them. Cover and let the batter rest for 5 minutes. – Heat the pan (I used non-stick pan), pour 1/4 cup from the batter in the pan, keep the heat medium low. 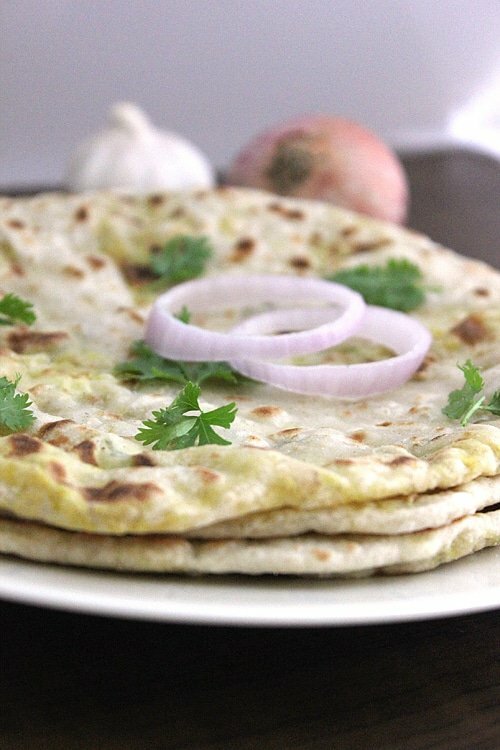 – When bubbles appear and the bottom is light brown, flip the pancake and cook on the other side for one or two minutes. – Serve hot, with your favorite toppings. They look fluffy and soft! 117 calories are for a piece or a portion? I just found your blog through Instagram and I love all the recipes I see here! 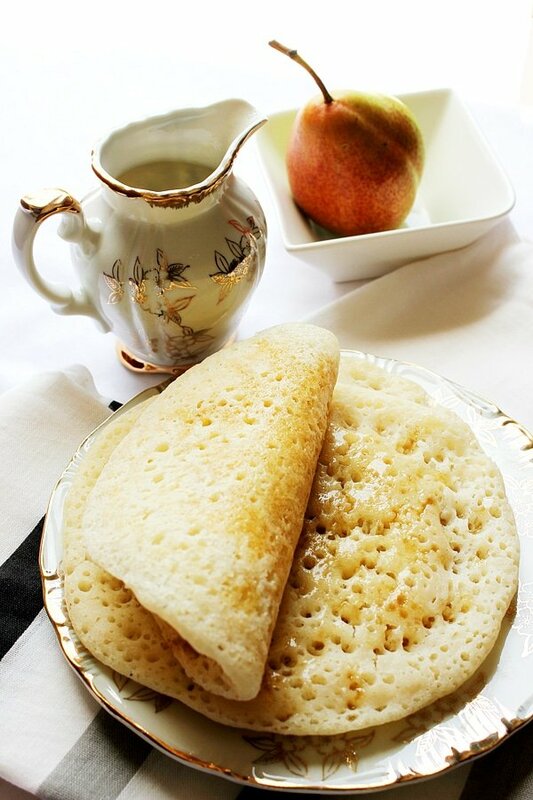 These pancakes look amazing and I’m excited to try them, since I recently made almond oat crepes and loved them. Pinned !Thanks for sharing! Hi Mira, It’s nice to have you on my blog 🙂 … Thanks for the kind comment dear, I love these pancakes so much and I hope you like them too!